I picked up a Loofah, Honey Body Souffle KD6/500, and Honey Body Scrub KD6/750. Both the scrub and souffle are in the French Lavender & Honey range/line/scent. Not sure if the loofah was part of the collection but it was just so big (notice how it dwarfs the other two products in the photo) and cute (pink!). Plus, I needed a new loofah. Plus it has a handy little rope/hook/thingy (I have no idea what that thing is actually called) so you can hang it up to dry when it’s not being used. I picked up the Honey Body Scrub because every time I see a new scrub at B&BW I just have to try it! I love exfoliating! Exfoliating products give me life! Also, honey is another ingredient that attracts me to beauty products. That said, this scrub was so oily that it leaked everywhere and anywhere even though the lid was tightly shut. It leaked in the bag all over the other products when I first got it. It leaked when I was taking photos for the blog. It leaked and is still leaking in the shower. Not travel friendly at all. It also leaves a film on the skin (and shower tiles). Aside from all that, this contains sugar crystals which is yet another ingredient that attracts me to beauty products (which we’ve already established). Many of my favorite scrubs include sugar crystals as the main ingredient, as does this but where my favorite scrubs leave my skin dry if not parched (which I actually prefer), this scrub leaves a film on my skin which goes away soon enough on it’s own but to me, dry skin straight out of the shower equates squeaky clean skin. I do not enjoy products that leave any type of film on my skin, be they makeup removers, body scrubs, or even hand soaps. Only once I am squeaky clean, do I pat myself dry and proceed to moisturize with whatever body butter/cream/souffle/lotion I am using at the moment. Basically, I use harsh products to effectively strip the skin of it’s moisture (more or less buffing away a layer of skin in the process) only to turn around and use other products to hydrate and replenish the skin’s moisture. Logic! 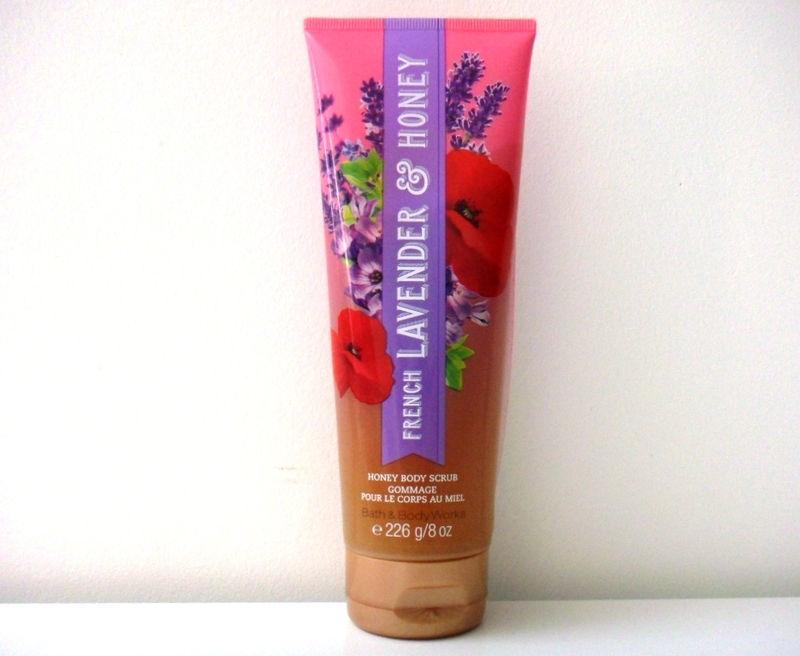 Now with the Honey Body Scrub, the oil in this (film and all) leaves me with ultra soft skin. The effects don’t last long so you do need to actually put on some type of moisturizer afterwards. On one hand, I don’t feel sufficiently clean after showering. On the other, I say again, ultra soft skin (temporarily). As for the scent, it has a delicate floral fragrance to it with a bit of sweetness. It’s very feminine and not quite my cup of tea but it’s not as obnoxious as the scent of the french lavender mason jar candles so I actually like it and enjoy using this scrub. I got this because the packaging gave me that old time-y vibe. Again, I had fantasies of wearing my non-existent silk robe, sitting at my non-existent old time-y vanity table and applying this “souffle“. There’s something that just seems so romantic about sitting at a vanity applying old time-y lotions and potions. The kitsch-y sticker with a floral theme on the otherwise beautiful rose-gold lid destroyed that fantasy for me. Also, the lid doesn’t fit properly when you screw the lid back into place (as evident by the middle photo) so the faulty packaging can lead to the product drying out or expiring earlier than the suggested shelf-life. It does come with a plastic sleeve so that kinda’ helps protect the product. As for the scent, it has that powdery quality to it’s scent, which I actually enjoy in moisturizing products because it fits in with my whole old time-y (vintage) themed fantasies. The fruity top notes give it a little bit of sweetness but make no mistake, this most certainly is a floral; a delicate fruity-floral most like the majority of bath and body work’s usual scents. Scent-wise, it’s very girly and feminine but again not quite my cup of tea. The souffle itself is actually extremely hydrating and leaves me with ultra soft skin, much like the scrub. I’ll use those two in conjunction with each other and end up with baby soft skin. Truths. The texture of the souffle itself is delightful. It’s not heavy and greasy, nor overly wet and runny. It just has that wonderful whipped (hence the name souffle) texture that’s light and almost airy that absorbs into the skin in seconds. 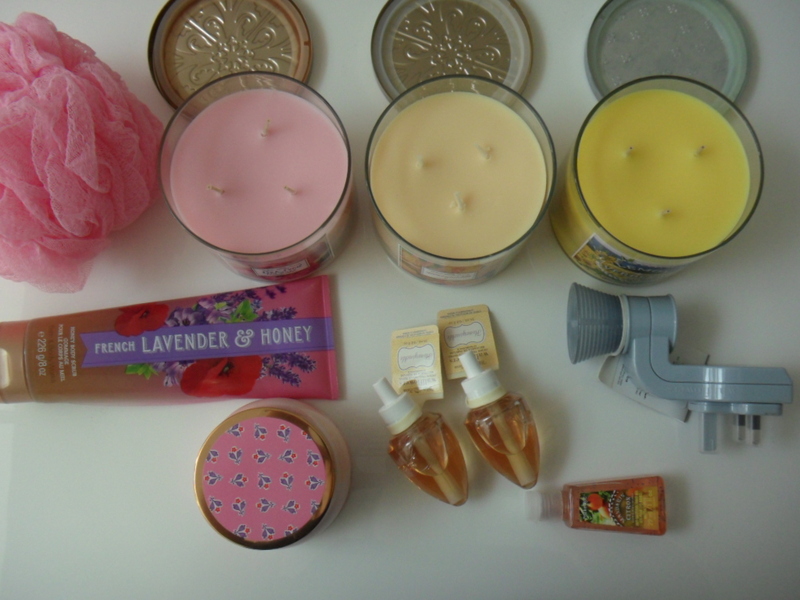 Aside from my Cotton Candy candles (which I will never ever burn) my candle stock was running low (read: running out). I’d accidentally broken the Endless Weekend Candle (gorgeous frosted packaging and all) so I picked up three 3-wick candles in the scents Honeysuckle (Garden Party Collection), Pink Petal Tea Cake (Garden Party Collection), and Lemon Verbena (Provence Collection). How gorgeous are the candle lids? These candles retail for KD7/000 each. Honeysuckle smells absolutely delightful! If I had to describe the scent in one word, I’d describe it as clean. It has that delicate, powdery quality to it but it also has some uplifting green notes as well. It’s neither feminine nor masculine, just clean and soap-y if that makes sense. I could swear I’ve sniffed this before maybe in perfume form… maybe it’s the peony petals. I’m starting to notice that regardless of how much I harp on about not caring for floral scents, a lot of scents that I favor have some variation of peony in them. This burns nice and evenly (as opposed to some of my other 3-wick candles) and the throw on this thing is fantastic! I have a somewhat large living area in my apartment which is why I had trouble smelling some of my other 3-wick candles when I burned them there. I moved them to smaller rooms and started burning them there, making their scent easier to detect. Honeysuckle can hold it’s own though, scenting up my entire living room area while still being mellow and not overpowering. The scent is very familiar to me and it’s actually starting to bug me that I can’t quite place the scent but as soon as I figure it out, I’ll be sure to mention it here. I love gourmand scents so when I sniffed Pink Petal Tea Cake I just about died of happiness! You guys, the scent is almost (but not quite) a dupe for my beloved Cotton Candy candles (the ones that I’ve placed strategically around my apartment to lightly scent the place). The only difference is Cotton Candy is a fruity (mango) vanilla whereas Pink Petal Tea Cake is a floral vanilla with a hint of “chai”. Pink Petal Tea Cake holds the place of honor (on my night stand table so I can smell it while I’m in bed) and has joined the never-to-be-lit club along with my Cotton Candy candle collection. I seriously regret not getting more Pink Petal Tea Cake candles because the scent is exactly my cup of tea… cake (let’s pretend that made sense). It’s my new favorite candle (after Cotton Candy, of course). In-store that’s exactly what the smell reminded me off, or if you’re in Kuwait, strepsils. If you’re a regular reader of my blog, you’ll know of my on-going love affair with anything Verbena so my heart couldn’t and wouldn’t let me just walk away from this candle. Banking on this turning out to be marginally better once lit, I adopted Lemon Verbena (by the proper channels of course) into my candle-family fold. I’m glad I kept my expectations low because although this smells great, the throw on this thing isn’t. Lemon Verbena is from the Provence Collection as opposed to the previous two hence the different lid. I’m not sure if the battered/weathered silver feel is on purpose or not but I love it with the accompanying fleur-de-lis imprint. I could do without the sticker though. 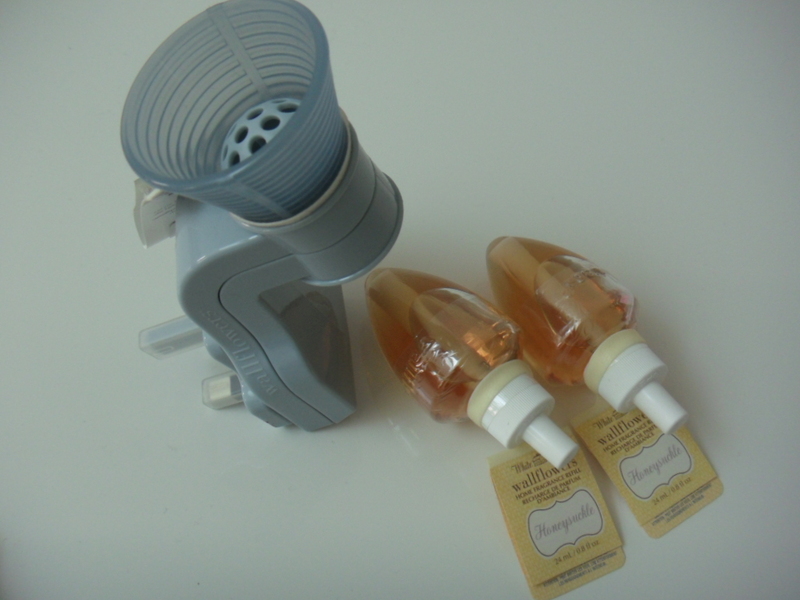 I got another wallflower fragrance plug for my new apartment and two wallflower fragrance refills. 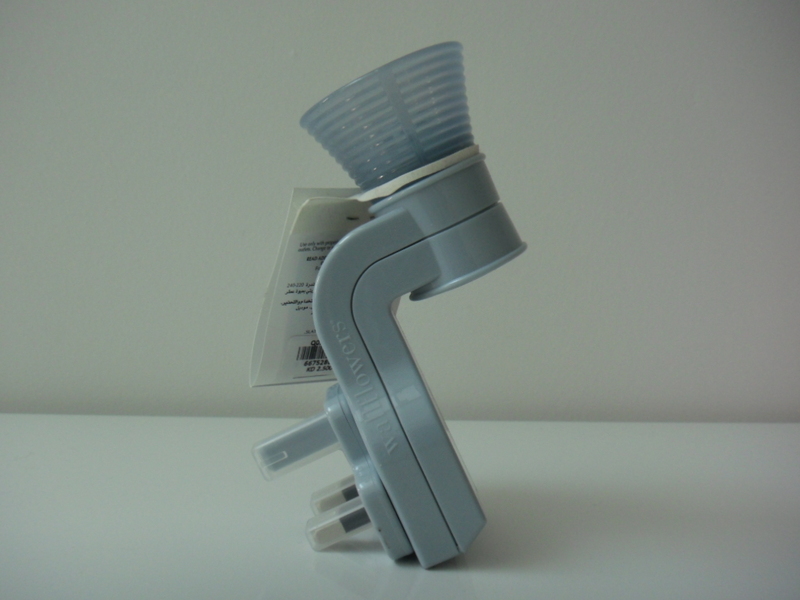 If you’re not quite sure what a wallflower fragrance plug is, click here because I’ve already explained it in detail. The wallflower fragrance plugs come in many colors and all together different designs (but I like to keep it simple). They retail for KD2/500 each. I chose two wallflower fragrance refills in the scent Honeysuckle to match the candle because I loved the scent that much. Like I said, it’s a “clean” scent. The wallflower refills are KD2/000 each. Scented with Provencal lemon and juicy mandarin sprinkled with cyclamen petals. 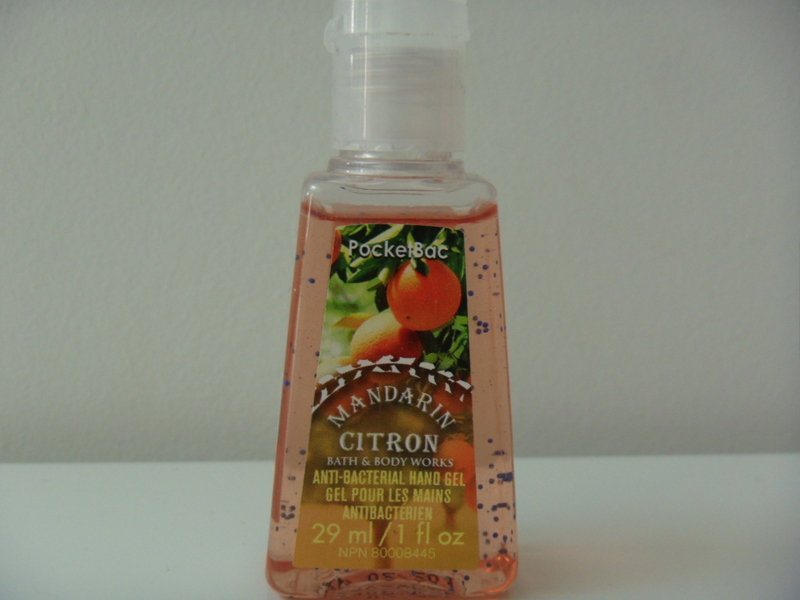 Lastly, I picked up a single PocketBac in Mandarin Citron for KD1/000.